Fancy doing some perch fishing this weekend? Then check out these great perch fishing tips to help you bag more stripey’s next time you’re on the bank. from how to feed to presenting your hookbait correctly. We’ve got everything you’ll need to have a netful of perch this weekend. Time and again perch are caught on worms from rivers, canals, lakes and drains. A tub of lobworms packed into your bag can result in a chunky specimen or two, even with a thick frost on the ground. 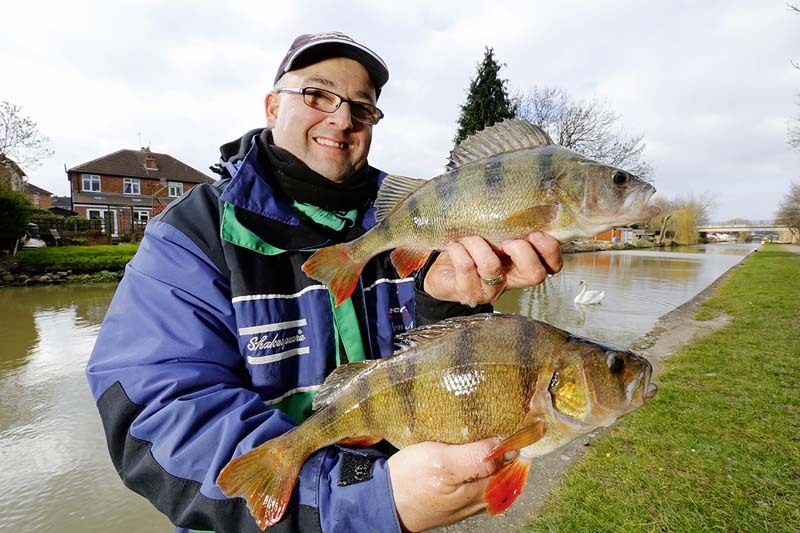 Shakespeare Superteam Bait-Tech skipper Darren Massey knows a thing or two about catching perch from Midlands canals. Not only can they be match winners, but they can turn a tough pleasure session into a day to remember. “Perch prefer clear water and cloud cover, although towards the end of the day as light levels drop, I’d always back a peg to come good regardless of conditions. They’re like any fish in that they feed best late in the day, so if I can just catch the odd fish building up to those final few hours, that will do nicely. “If I catch then I’ll keep on going until the bites die off completely, which tells me I’ve caught all the perch which are in the area. “I then feed again, rest the swim and return. Some more fish should have moved in by then and I repeat the process of fishing it out. This way of fishing is very instant, so if you’re waiting five minutes for a bite, don’t waste your time. “Having that second or third line helps in this instance and I follow the same principles on this, waiting until the bites cease before resting it. “Lift too early when the float buries and you’ll miss it, because perch like to take a few seconds to fully engulf a bait. “When the float goes, I’ll count to three in my head and then strike hard. If I miss, chances are it will have been a small perch on the other end. Find some cover – or depth! “You don’t have to feed masses to catch perch, and I’d actually warn about getting too carried away and piling in the feed. If you think about it, you’re fishing for maybe half-a-dozen big fish and it would be very easy to fill them up with one big potful of bait. “There’s the temptation to gear up with strongarm tackle when faced with the chance of a 2lb or 3lb fish, but that’s not always needed. A heavy rig is, of course, best but there will be days, especially in clear water or when there aren’t so many perch present, when a lighter rig catches better. “I’ll set up a heavy pole rig with 0.14mm Shakespeare Mach XT line straight through to a size 13 Kamasan B711 hook and a solid 12-16 elastic for fishing lobworms. “However, there’s also a lighter set-up with 0.12mm XT straight to a size 16 Sensas 3405 hook and a doubled No6 solid elastic. This is for fishing casters or pieces of dendra worm when the perch aren’t going mad and need a more refined presentation.